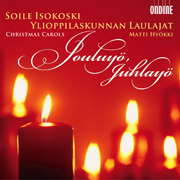 Ondine's Christmas album Jouluyö, juhlayö ("Silent Night, Holy Night"), featuring the Finnish star soprano Soile Isokoski and the YL Male Voice Choir conducted by Matti Hyökki with a collection of popular Finnish Christmas carols, has exceeded the gold disc plateau of 15,000 sold copies in Finland alone. The CD was released for the Finnish market in October 2006 and will be available internationally in autumn 2007. Soile Isokoski: "I am very happy to receive my first gold disc for this album. Recording it was a truly rewarding experience." Recognized as one of the finest singers of her voice type, Soile Isokoski is a regular guest at the most renowned venues of the world. After graduating from the Sibelius Academy, she gave her début recital in Helsinki in 1986 and subsequently won a number of important international singing competitions. Soile Isokoski continues to work together with numerous renowned conductors including Esa-Pekka Salonen, Sir Colin Davis, Daniel Barenboim, Sir Simon Rattle, Claudio Abbado and James Levine. Soile Isokoski has a wide-ranging concert repertoire and regularly gives recitals with her permanent accompanist Marita Viitasalo. The YL Male Voice Choir is a pioneer in Finnish choral music. Founded at the University of Helsinki in 1883, it is the oldest Finnish-language choir in Finland. Its cultural merits, extensive history of concerts, several tours abroad and numerous critically acclaimed recordings have established it as one of the world's most prominent male voice choirs. The conductor of YL is Matti Hyökki, D.Mus.